The 9 Best Bagel Shops in Colorado! To the delight of Coloradans, a New York influence has washed over the Centennial State’s top-notch bagel scene. Whether you are seeking classic bagel creations like cream cheese and lox or more creative concoctions like bagel sandwiches or specialty cream cheeses, there is a bagel shop in Colorado for you. Bagel lovers in the state can rejoice with the delicious bagels coming out of the nine best bagel shops in Colorado. Owned by a New York native, Rosenberg’s Bagels pleases bagel lovers with a unique menu that also hasn’t neglected the classics. Find fish smoked in-house, a variety of different bagel types and bagel sandwiches with creative combinations. Try the Heebster made with scallion cream cheese and whitefish salad. The local favorite, however, seems to be the green chile cream cheese, which mixes a classic bagel topping with a Colorado favorite. Moe’s Broadway Bagel, which is family owned and operated, has become a popular spot for New York-style bagels in the Denver area. Bagels are made daily, so make sure to swing by the multiple locations in Boulder and Denver for a fresh morning bagel. Find classic bagels topped with cream cheese and lox, or venture into more unique cream cheese flavors like jalapeno or maple walnut. The Bagel Deli is known for its Eggs Bagel-Dict, a take on the breakfast classic eggs benedict. Not only will you find your classic bagel and cream cheese combinations at this Jewish deli but also other favorite deli foods. This family-owned and operated deli in Denver is a local hotspot for the perfect bagel breakfast. Ever since opening in 1996, Big Daddy Bagels has been making bagels from scratch. Due to its great tasting bagels, it’s no surprise why Big Daddy bagels has now expanded to multiple locations along the Front Range. With great prices and numerous bagel and cream cheese options to choose from, Big Daddy Bagels is definitely one of the best bagel shops in the state. There is no doubt why Gib’s Bagels has won “best bagel” in Fort Collins for numerous years. 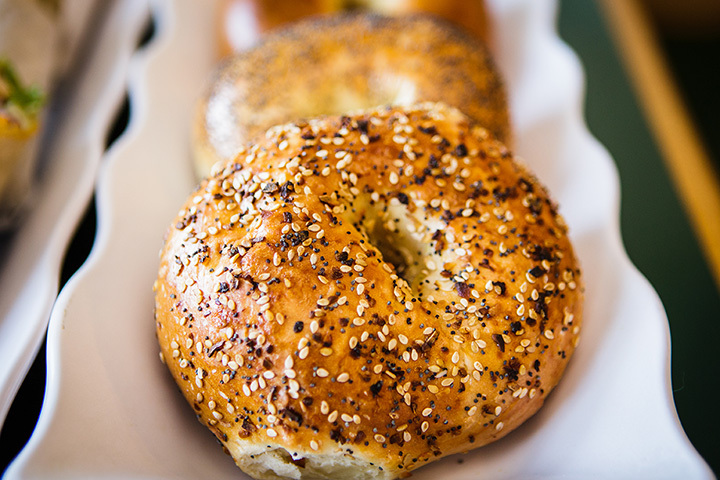 For over 20 years, Gib’s has created bagels from locally-grown wheat and locally-produced dairy products. However, the ingredients are just a small part of what makes these bagels the best. According to the owner of Gib’s, the bagel creating process is just as important as the ingredients. These carefully-crafted bagels are perfect on their own or pair with a specialty cream cheese or enjoy as a sandwich. Rocky Mountain Bagel Works has been serving Fort Collins since 1993. The bagels here are fresh and made every single morning. The flavored cream cheese pair great with these delectable bagels. Enjoy a bagel sandwich with chicken salad, tuna salad or even hummus for a savory breakfast or lunchtime pick-me-up. Located in Colorado Springs, Olde World is undoubtedly the best bagel shop in the city. The bagels and pastries at Olde World are made in-house and from scratch. Enjoy a bagel breakfast or even soups and salads for lunch. This East Coast-style deli has been serving deli favorites, including bagels, since 1985. Located in the Cherry Creek neighborhood in Denver, Zaidy’s Deli sure knows how to make a bagel right. The Lox Melt is a local favorite, which includes a classic bagel topped with lox, tomato, onion, cream cheese, capers and sprinkled with melted cheese. This Denver bagel shop prides itself on making kosher, dairy-free and preservative-free food. The Bagel Store has been making incredible baked goods, including bagels, challahs and pastries, for more than three decades. This family-owned and family-friendly establishment is a great place to grab breakfast for your family.